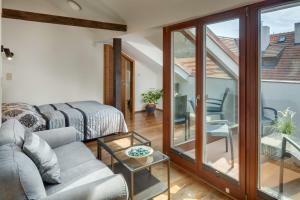 With city views, Art Suites Spalena is set in Prague and has free WiFi. All units include a fully equipped kitchen, allowing guests to prepare their own meals. A dishwasher and microwave are also featured, as well as a coffee machine. A continental, Full English/Irish or vegetarian breakfast is available every morning at the property. The apartment provides a laundry service, as well as business facilities like fax and photocopying. Prague Astronomical Clock is 2.3 km from Art Suites Spalena, while Old Town Square is 2.3 km away. When would you like to stay at Art Suites Spalena ? This apartment has a flat-screen TV, seating area and tumble dryer. A damage deposit of EUR 50 is required. The host charges this 7 days before arrival. This will be collected by credit card. You should be reimbursed on check-out. Your deposit will be refunded in full via credit card, subject to an inspection of the property. Please inform Art Suites Spalena in advance of your expected arrival time. You can use the Special Requests box when booking, or contact the property directly with the contact details provided in your confirmation. Each day we'll check prices and send you an email for your selected dates at Art Suites Spalena. If you don't have specific dates but would like to check prices for say next weekend or say next month we can check the price too. Click to write a review and share your experience of Art Suites Spalena with other travellers.